JEDDAH, Saudi Arabia, Sep 21 2018 (IPS) - Marjani F, 44, spent 8 years in Riyadh, Saudi Arabia’s capital working as domestic help. “My husband was killed by the military after being accused of organizing a protest. I have four children and there was no way I could pay the bills staying there,” she says. For nearly a decade, she lived and worked as an undocumented domestic worker employed by a Saudi family until she was deported in 2017. Marjani is now living in Bahir Dar, a city in Ethiopia, and describes her life back home as “hopeless”. Marjani was one of the reportedly 5 million undocumented migrants living in Saudi Arabia – a country with an official population of 33 million. But this leniency have changed radically recently as the Kingdom is now actively seeking to deport them as part of its new economic reforms agenda. A campaign called “Nation Without Violators” was launched in 2017 that was to “progress to deport foreign workers illegally staying in violation of residence, labor, and border regulations of the Kingdom”. “A 90-day amnesty began in March 2017 that allowed undocumented migrants to finalize their status and leave the country without any penalties,” says Harith. The amnesty was extended twice and, according to official statistics, at least 800 violators per day were voluntarily deported during the 9 month period. By the end of the amnesty period, reportedly 45,000 Ethiopians – including Marjani – had registered with the Saudi government and voluntarily returned home. The remaining estimated 500,000 Ethiopians in Saudi Arabia are continuing to live in fear as security authorities are actively continuing to deport undocumented migrants in the country. Violations can result in deportation, a prison sentence, and fines ranging between SR15,000 ($4,000) and SR100,000 ($26,700). “There are concerns over the humanitarian impacts of returning hundreds of thousands of people back to endemic poverty and potential harm,” says Ayda Gebre , an aid worker for RATSON – Women, Youth and Children Development Programme, a community development NGO based in Ethiopia. RATSON has been working on assisting Ethiopian migrants settle back in the country. 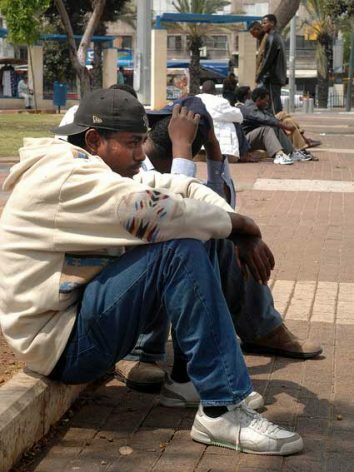 While the role Ethiopian migrants play in helping the country’s economy is significant – in 2015, Ethiopians abroad sent back nearly $4 billion to the country coping with crippling poverty. And while many Ethiopians in Saudi Arabia come for economic reasons, a significant number arrived after fleeing serious abuses at the hands of their government. During crackdowns on undocumented migrants in 2013 in Saudi Arabia, over 160,000 Ethiopians were returned. Most of the Ethiopians interviewed by Human Rights Watch who were part of the 2013 Saudi expulsions were detained within a week of their return to Ethiopia. “Most of them were tortured in detention and had, in fact, originally left because of Ethiopian government human rights violations,” says Gebre. Ethiopia has long been criticized for its human rights violations including its harsh prison conditions, brutality of security forces, lack of freedom of speech, and forced displacement. “In many other countries, Ethiopians just might be able to claim asylum and potentially be entitled to international protection,” says Gebre.